Let us manage your Facebook, Twitter, and other social media profiles so you can experience a surge of new customers as well as increased customer satisfaction levels. It’s simple to get started and best of all it requires very little effort on your part. 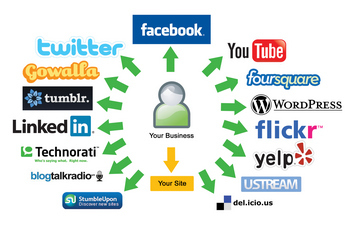 Do you know why you need social media management? Read more here or fill out the form on the right hand side of this page for a free report! A dental company has over 4,000 patients including past clients. Currently they stay connected via traditional mail, that’s over $1,600 in stamps. Every quarter, they spend a few $1000 on traditional broadcast media such as radio and TV. The total return on investment is hard to track and the marketing isn’t very targeted. They need a better way to stay connected and increase their patients and profits. We help your business stay connected with your new and existing customers on their turf, in a manner that generates word of mouth referrals. A relatively young chiropractic company has around 1,000 patients including past clients. They want to spread the word about their innovative services and how well they work. Traditional advertising hasn’t done the trick. In comes social media marketing. Social marketing encourages customers to engage with businesses online social profiles which helps generate online word of mouth. There is proven social media engagement tactics that are extremely successful at creating buzz and increasing word of mouth amongst peers. We will help you generate social content that will get the word out about your innovative services and establish trust within online communities. A local restaurant always has new food and drink items on their menu as well as daily specials for lunch and dinner. They wanted a way to get the word out but traditional mail and radio broadcast is expensive and people aren’t visiting their website every day to see these specials! Man can we turn this around for you, guaranteed! Social media apps and mobile phone apps, when leveraged properly, can drive a tremendous amount of foot traffic to local restaurants and retail stores.